Being a type of Variable Speed Drive, an Adjustable Speed Drive can be employed in any application that requires precise electrical control over mechanically powered equipment. There have been several methods for motor control, however Adjustable Speed Drives are gaining fame due to their increased energy efficiency. Adjustable Speed Drives are limited to AC Motors, and therefore having a quality motor can greatly upheave your manufacturing capabilities. The development in Adjustable Speed Drive technology has allowed operators to gain precise control over their equipment, coupled with AC Motors. The use of this technology protects machinery from undue damage as the amount of torque generated by the motor would be dependent on the user’s parameters. Whenever AC Motors are started, they draw an inrush current equivalent to 7 – 8 times the nominal fill-load current. The current generates a high amount of heat and puts stress on the motor windings, which with the passage of time deteriorates the motor’s life. Using a quality AC Motor in conjunction with an AC Drive allows motor to be started at zero frequency and voltage! The gradual buildup in frequency and voltage prevents any sudden in-rush current. Any increase in current is subject to increase in the motor’s speed, which is dependent upon the user. As a result, the operator experiences longevity in the motor’s operation. The entire power distribution system connected to the motor is placed under enormous strain due to the inrush current. This brings in sag into the supply voltage and negatively effects the capacity of the entire system. Furthermore, sensitive loads such as computers, sensors, contactors, etc. would also be at risk. The use of AC Motors allows Adjustable Speed AC Drives to take over and eliminate voltage sag, resulting in a more resilient power system. No product or technology is implemented at a large scale until it is economically feasible. The use of AC Motors along with Adjustable Speed Drives can greatly reduce energy consumption. The speed is controlled by varying the frequency and voltage rather than controlling the current through resistors or other wasteful methods. 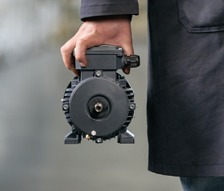 This results in continuous energy savings over an extended time period, offsetting the initial investment in the motor and drive. 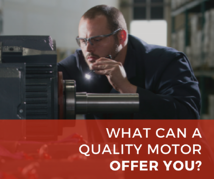 Interested in learning more about quality AC Motors?